Context: When the game first came out GW used to be very very challenging to the point that only it felt like a real milestone if you finished all of it, to the point that this board seemed to be filled with messages that it was too hard. It was re-balanced several times and is now sim-able. Issue: I would like a better testing ground for some of my teams and GW seems like the best place to do it but it is so easy. For those with a more mature inventory it would be great if GW was more of a challenge, partly to test different teams out, and partly for fun and the challenge. Solution: Keep the difficultly exactly the way it is, unless if GW is now sim-able by the player. At that point, bump up the difficulty. It allows people who want to try something harder an opportunity to do so, but at the same time for those that do not want to bother with it, they can just sim as they probably are doing so today. To me it looks like a win-win. Agree to a point. I'd rather CG revert GW back to how it used to be. GW used to be the mode that I had the most fun in every day. Now, I'm facing opponents that don't even get a single turn even in the last battle - and I'm not even using my best squads. I wish GW would go back to however it used to be. At least then there were a few battles that were challenging and helped me improve and refine my strategies against specific squads or characters. I still finished nearly 90-95% of GWs (before the change, now 100%), but at least 1 or 2 battles would make me think about what to do. Now, it's just click and they are all dead and it's not fun anymore, it's just a time sink and a bunch of clicks. It doesn't even require thinking or planning or a strategy. This is a good idea! Please do this! I like it the way it is because as I build up different factions it gives me as close to a "sandbox" style testing arena to try them out. 12 attempts to fiddle with composition, mods, etc and varying difficulty. It's no longer impossible, and when you hit a wall with your newly developed team or you've done enough testing, hit "sim" and continue your day. How can you test the different factions when you can 1-hit each character or 1-hit the entire opponent squad? My GW is way too easy now. I like this idea. GW is still somewhat challenging for newer players, but it isn't quite the impossibly difficult challenge that it used to be. Once you can sim it, you would have the option to just sim and be done or use it for the difficult testing ground which is nice. Easy GW does have some usefulness for long time players. I use it to test out squads that are not properly geared yet, as a way to determine if I would like to gear them further or wait. Sure, if I throw in one of my top 5-10 teams I crush the GW opponents, but I get to use those squads in arena/TB/TW/GA all the time. I do support the addition of a sandbox practice battle type of mode though. 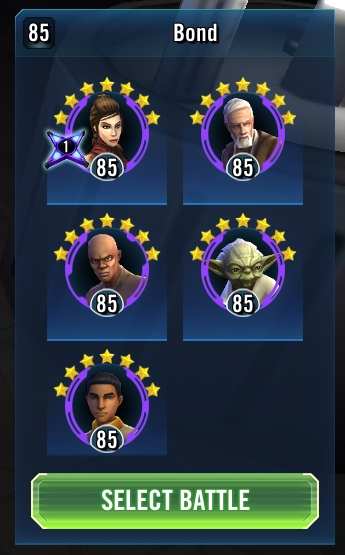 I am at 81lvl and my top team is 66k p, while this is 76k p. By the time i get Bastila bonus protection down they are soo buffed up that joda starts to one shot my characters. And thanks to bonus tenacity i have almost no way to debuf or stun any of them. KRU + FO. Tenacity down wrecks her zeta. KRU can stun right through the tenacity up anyway, and strip debuffs, so can Executioner and FOST. You'll gain more TM than she does using Phasma or OG Kylo, and FOO. Tried KRU + FO, KRO gets to 2-3hits max, also need another dispell char for mace/ben first turn taunt while buffed joda whecks me with 20k+ dmg hits. But if i do that, i dont have spots for heavy hitters to taky any of them down. Mine capable chars are around 10k p while whole this team is 13-18k + much more tanky and +35% more dmg thanks to protection. The moment joda get to turn he does 3 turns before i ca do something, buff, aoe and then kills one of my chars with 35k dmg. My idea would not effect you ShawDu. You have not completed the min number of GW to be sim able, and yes at 4.3 million gp, GW is easy. My idea is more to address both newer and veteran players. Just an off topic question. How long it took you to get 4,3 mil gp, for me it feels like an imposible number to get. Three years, been playing since launch...and still have more to do and farm. Priorities shift and change. I just manage my expectations, I know I won't always get the newest shiniest thing, so I figure out what I want or what sounds fun and do that these days.